Any sort of dal preparation always falls in my comfort-food! A few weeks back, better I say on a lazy weekday evening… I wanted to have a quick meal that makes me spend more time watching tv :P And yes, since I read a bengali cholar dal recipe somewhere while surfing over blogosphere, I decided to try it out! I made it before but I didn’t even remember the taste or texture of this dal. Asked my hubby if he would be fine to have cholar dal with a bowl of jeera rice n he agreed! I got a fistful of chana dal, pressure-cooked, tempered n cooked again… n bingo!!! It was ready to serve… I loved the taste, but more I loved my ‘Cholar Dal‘ with visible n crunchy bites :) Simply superb it was… I’m sure it’s not an authentic one, but must-try dish for sure! 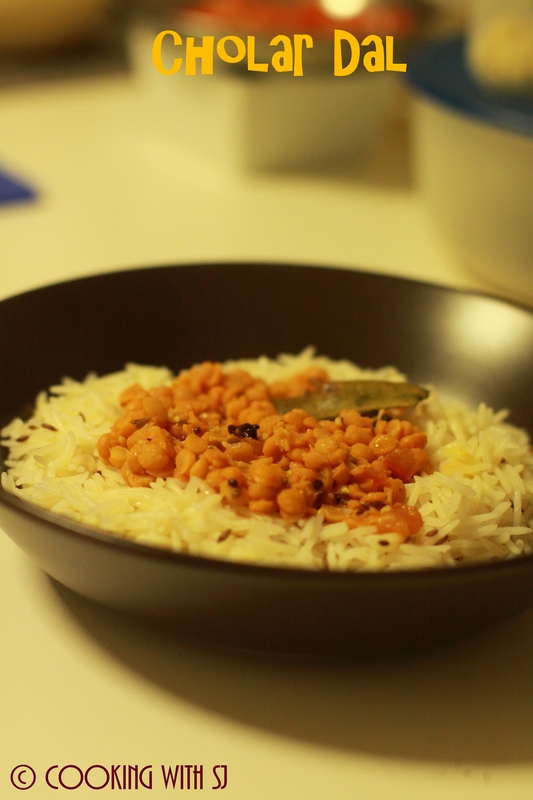 Soak chana dal for 3-4 hours in plenty of water and pressure-cook it for 4 whistles. Drain excess water (reserve ½ cup of it) and keep it aside. Heat 2 tsp ghee in a pan and add cumin seeds, hing. Once it crackles, add chopped onions, green chillies and minced garlic. Saute it for a minute. Add pressure-cooked chana dal in pan along with reserved water. Add all the spices and mix well. Cook for covered for 10 mins. Once done, transfer it to a serving bowl. Heat 2 tsp ghee in a tadka pan and add all whole garam masala into it. Once it starts getting brown in color, drizzle this over prepared dal. Cover it quickly with a dish or lid for 2-3 mins to retain aroma. Garnish with coriander leaves and drizzle lemon juice before serving it with a plate of steamed basmati rice!